Q1:Can we use our own item number or print our logo on the products? A: Of course, you can. Q2: how many items can I choose for one container? Q3: how many designs can I choose for themetal body flasks? Q4: how many deposit should I pay? A: We always ask for 30% deposit in advance, balance should be paid after sending B/L copy. A: The glass liner inside the vacuum flask is purchased from the best glass factory in China, we can promise the quality of our products. Q6: What's the function of our vacuum flask? A: Our vacuum flasks can keep water warm for 24 hours. Q7: Which payment term can we accept? A: We always cooperate with our customers via TT and L/C at sight. 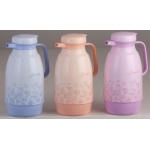 A: 1.The MOQ for customer's own colours and designs for plastic beverage bottles in our factory is 1200 PCS . 2.You can inform us the Pantone number of your own colour and your own design , we can make it on the body of the plastic vacuum bottles . Q9: What should we pay attention to when cleaning vacuum flasks? A: 1) Vacuum flasks should be cleaned periodically. It is advised to use a mixture of water and soda or detergent.Then rinse the mixture thoroughly. 2) Do not immerse in water. 3) Do not put in dishwasher. 4) Do not use brush or harsh cleaners. Q10: What should we pay attention to when using AIR POT with Glass Refill? A: 1) Your AIR POT is designed specifically to be carried and used only in an upright position. Avoid careless handling, tilting, tipping or dropping as they may result in damage and leakage which can cause personal injury. 2) Do not tilt or turn the VACUUM AIR POT upside down as liquids inside will leak or flow out, which can cause personal in jury or property damage. 3) Never drop or give a strong impact or shake to the AIR POT as the glass liner may shatter. 4) Never fill with dairy products,chemicals, alcohol, solid food, or sticky materials. 5) Only fill with premixed liquids. Never put ice in the AIR POT or attempt to stir liquid as both may result in the shattering of the glass liner. Q11: What should we pay attention to when using AIR POT with stainless steel liner? A: 1) VACUUM AIR POT is designed specifically to be carried and used only in an upright position. 2) Do not tilt or turn AIRPOT upside down as liquids will leak or flow out, which can cause personal injury or property damage. 3) Never fill with dairy products,chemicals, alcohol, solid food, or sticky materials.